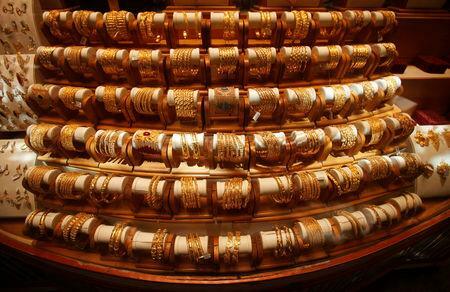 BENGALURU (Reuters) - Gold rose more than 1 percent on Monday to its highest in about 2-1/2 months as investors sought refuge in the metal after mounting tensions between Western powers and Saudi Arabia compounded jitters in global stock markets. Spot gold was up 1 percent at $1,230.05 per ounce at 1406 GMT, having touched its highest since July 26 at $1,233.26. U.S. gold futures rose 1 percent to $1,234.20. "Gold has now got a stronger tailwind from a flight to safety from risky assets," said Quantitative Commodity Research analyst Peter Fertig. "Gold's next moves will depend on how long this sell-off continues." The International Monetary Fund said last week that risks to the global financial system, which have risen over the past six months, could increase sharply if pressures in emerging markets escalate or global trade relations worsen. On the technical front, gold broke above the 100-day moving average at around $1,227. A close above that could provide additional support, analysts said. Other indicators, such as inflows into exchange-traded funds (ETFs), suggest chances of a further rebound in prices, he said. Holdings of the largest gold-backed ETF, SPDR Gold, rose nearly 2 percent last week. That was its biggest weekly inflow since January, with the fund having registered declines of more than 4 million ounces since hitting a peak in late April. Gold, usually seen as a safe store of value during political and economic uncertainty, remains about 10 percent down from its April peak, with investors opting for the dollar as the U.S.-China trade war unfolded against a background of higher U.S. interest rates. Speculators meanwhile extended their net short position on Comex gold by 29,881 contracts to 103,009 contracts, CFTC data showed last week, based on the week up to Oct. 9. In other precious metals, platinum rose 0.6 percent to $841.60 per ounce after earlier touching its highest since July 10 at $850.10. Palladium rose 1 percent to $1,077 and silver gained 1.1 percent to $14.71.